Each vintage, 100% of the wines produced by 13th Street Winery are made from fruit sourced exclusively in the Niagara Peninsula with 85% or more coming from our own vineyards. Our very first vines were planted at the 13th Street Vineyard in 1976. In the years since, we’ve planted Gamay Noir, Pinot Noir, Chardonnay, Riesling, Cabernet Franc, Merlot and Pinot Gris and now have amassed more than 40 acres of estate vineyards in the VQA Creek Shores appellation of Niagara. Visit the VQA Ontario website to learn more about Ontario’s appellations. 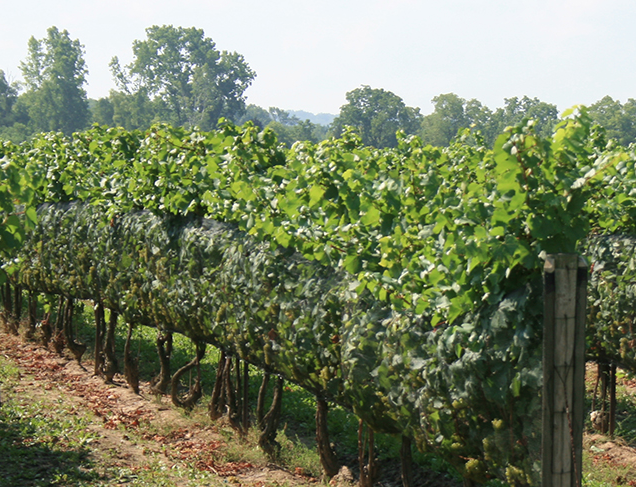 Wine Country Ontario is another great source of information on Ontario’s wine industry! Co-owners of the winery, the Whitty family has been farming fruit in Niagara for well over 100 years. Each new generation employs a sustainable and minimal interventionist approach to viticulture, respecting the life of the land and ensuring it stays healthy and happy for future generations to come. Our vineyards are trained using vertical shoot positioning and yields are kept low to ensure the vines’ energy is directed to the ideal number of bunches. We handpick and field sort our grapes to maintain much better control of the quality. We employ shaker and sorting tables to further ensure the soundness of the fruit used for wine production. In select vintages, we purchase limited quantities of grapes from other respected Niagara growers who maintain the same high standards and show the same respect for their vineyards. The 13th Street Vineyard, located at the original winery site, contains the oldest vineyards in our portfolio. Although a small vineyard, it yields fine old vines Riesling fruit, as well as high quality Pinot Noir for sparkling wine production and limited quantities of old vines Cabernet Franc. 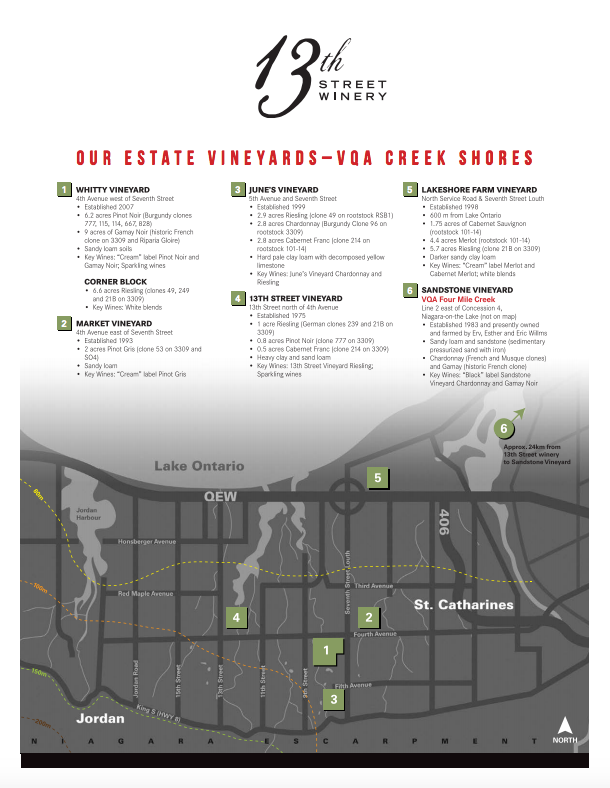 June’s Vineyard is located on 5th Avenue west of Seventh Street Louth. A gorgeous site at the base of the Niagara Escarpment, the distinctive terroir guarantees that “June’s Vineyard” bottlings will always be amongst the most unique and expressive in our portfolio. The Whitty Vineyard surrounds the winery itself on 4th Avenue. Home to numerous French clones of Pinot Noir and Gamay planted in separate blocks, this expansive vineyard yields high quality fruit for both our Cream and Black label wines, all classic expressions of the Creek Shores appellation. The neighbouring Corner Vineyard to the east is planted to three clones of Riesling. A small vineyard just to the east of the Whitty Farms outdoor seasonal market on 4th Avenue, the Market Vineyard is home to a small block of Cabernet Franc and is our only estate vineyard planted to Pinot Gris. Mere metres from the shores of Lake Ontario, the Lakeshore Farm Vineyard benefits from the regular breezes and moderating effects that the lake provides in the spring and fall, thus ensuring it is the vineyard with the latest bud burst and often amongst the earliest harvested. Riesling and Merlot make up the majority of plantings here. 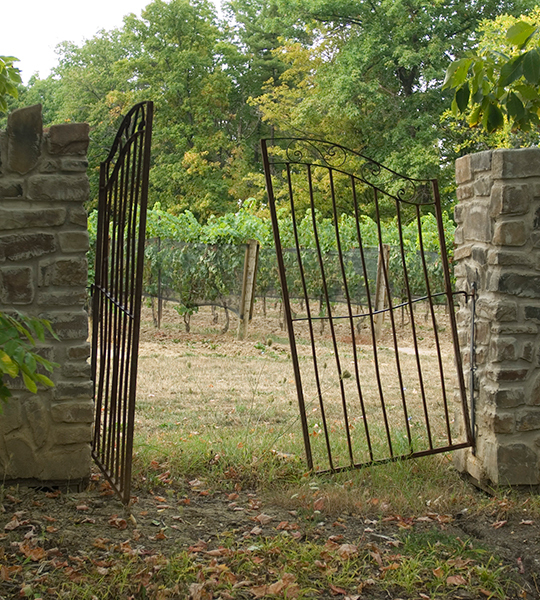 The Sandstone Vineyard located in the Four Mile Creek appellation of Niagara-on-the-Lake was planted in 1983. It is owned and capably nurtured by friends of the winery, Erv, Esther, and Eric Willms. Located in one of the warmest appellations of Niagara, it provides us with some of the very best grapes for our award-winning Reserve Gamay Noir and Chardonnay. Click here for a detailed map of our vineyards (PDF file).